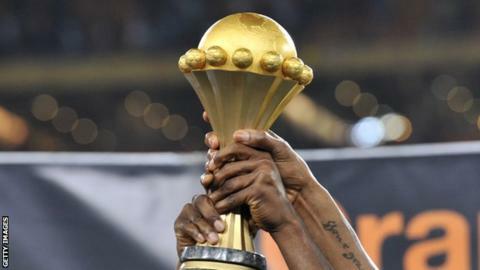 The draw for the 2015 Africa Cup of Nations (Afcon) qualifiers has been made at the headquarters of the Confederation of African Football (Caf) in Cairo, Egypt. The defending champions Nigeria have drawn South Africa in one of seven qualifying groups. North African rivals Tunisia and Egypt will face each other; Ghana will meet Togo, and Ivory Coast and Cameroon are drawn together. Three teams were drawn in each group at Sunday's ceremony. A fourth team will emerge from two more qualifying rounds. Eventually, the group winners and runners-up will go through to the 2015 finals, as will the best third-placed side and the hosts Morocco. These are all two-legged qualifiers, with the team named first hosting the opening leg on the weekend of 18-20 July. The return leg will be played on the weekend of 1-3 August. The aggregate winners advance to the group stage. The top two countries in each group, plus the best third-placed finisher qualify for the finals along with the hosts Morocco. The group matches will be played 5-6 September and 10 September; 10-11 October and 15 October; 14-15 November and 19 November.